Something Strange & Deadly, Final Discussions! First off, let me start this post by sharing my Dragon*Con schedule (since that’s where I’ll be all of Labor Day weekend). Sarah J. Maas and I will be chillin’ like villains–and IN COSTUME, no less–while planning out more of our Starkillers Cycle during every free second we get. Second, if you missed our FINAL DISCUSSION QUESTIONS (plus the chance to win a signed copy of Throne of Glass by Sarah J. Maas), head here. As hard as this might be to believe, Chapter 19 happens to be my favorite chapter in A Darkness Strange & Lovely. Yep, that’s right–it’s the EXACT same chapter number as my favorite in Something Strange & Deadly. And it’s not that I don’t love all the other chapters in book 2, but I had a massive case of writer’s block right before Chapter 19 in ADS&L. After days of pulling out my hair, the light finally burst through the clouds…and chapter 19 all the way to the end just poured out of me. BUT, since I know many of you wonderful readers haven’t yet read A Darkness Strange & Lovely, much less read Chapter 19, I didn’t want to spoil those scenes with a playlist breakdown. Instead, I thought I’d share a playlist that goes with the opening scenes of A Darkness Strange & Lovely. First, I’ll share the actual playlist so you can listen, and then I’ll break down which piece I associate with which pages. AND, I’ve got the first 85 pages of the book embedded below that so you can listen and read along. 🙂 Enjoy! Something Strange & Deadly Book Club FINAL WEEK! Welcome to the final week in the Something Strange & Deadly book club! Oh, and–whether you participate in this book club or not–you’ll definitely want to stop by the Epic Reads discussion board! SS&D Book Club, Week 3 Discussions! I can’t believe the third awesome week in our book club is already over! Waah! Only one more week to go! And, as you all have every week, you’ve totally impressed me with your answers. If you missed my movie casting on Wednesday, make sure to drop by. I’d love to hear who YOU envision playing the various characters. This could totally be a movie still from Something Strange & Deadly, the Movie (coming to a theater near you when pigs fly). Welcome to week 3 in the Something Strange & Deadly book club! If you missed the awesome discussions last week, be sure to check them all out here. I’ve got the full list of people who’ve shared their responses with me via the participation prize form and week 2 giveaway form. Shared pictures of 1876 Philadelphia! Discussed their first impressions of Daniel Sheridan! Talked about their favorite characters in the series! For those of you just joining this, here’s how the book club works: I have the week’s discussion questions (one for book 1 and one for book 2) below. You have the rest of August to answer these, and you can answer them anywhere on the web (that’s publicly visible, of course). If you don’t want to answer this week’s discussion question, that’s fine! You can chime in next week (the final week). One discussion qualifies you for the participation prize. 🙂 What is the prize? A copy of the e-novella A Dawn Most Wicked or an exclusive cut scene from A Darkness Strange and Lovely. SS&D Book Club, Week 2 Discussions! Happy Friday, world!! Thank you for another FUN week in our book club discussion! Your answers are all so insightful–I’m honestly thoroughly impressed. Welcome to week 2 in the Something Strange & Deadly book club! If you missed the line-up of discussions last week, be sure to head here. I’ve got the full list of people who’s shared their responses with me via the participation prize form and week 1 giveaway form. Kate at the YA Book Fanatic! Now, just in case you’re late joining this, here’s how the book club works: I have the week’s discussion questions (one for book 1 and one for book 2) below. You have all of August to answer these, and you can answer them anywhere on the web (that’s publicly visible, of course). If you don’t want to answer this week’s discussion question, that’s fine! You can chime in next week…or even in the final week. One discussion qualifies you for the participation prize. 🙂 What is the prize? A copy of the e-novella A Dawn Most Wicked or an exclusive cut scene from A Darkness Strange and Lovely. SS&D Book Club, Week 1 Discussions! Hey guys!! Thank you for an AWESOME first week in our book club discussion! It was really cool to read everyone’s answers. If you missed my video on Wednesday, be sure to check out my atrocious reading skills. I tried to at least make all the background and music pretty, to compensate for my painful audio-book skills. Still, I hope you enjoy this brief excerpt! Eleanor finds herself with next to nothing at the start of A Darkness Strange and Lovely. Do you think she is justified in leaving Philadelphia and leaving behind her mother? On the flip side, can you put yourself in Mrs. Fitt’s shoes and understand why she might be so cruel toward Eleanor? 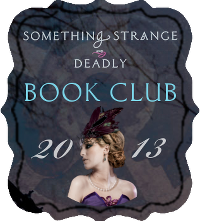 Welcome to week 1 in the Something Strange & Deadly book club! I’m SO amazed by the amount of people who have signed up, and I hope–as the word spreads–that more people might jump in! If you know of anyone interested in joining, please direct them to the sign-up form here. Now, I’m sure many of you are wondering how exactly my book club works. Basically, I have the week’s discussion questions (one for book 1 and one for book 2) below. You have all of August to answer these, and you can answer them anywhere on the web (that’s publicly visible, of course). If you don’t want to answer this week’s discussion question, that’s fine! You can chime in next week…or the next. Or even in the final week. One discussion qualifies you for the participation prize. 🙂 What is the prize? A copy of the e-novella A Dawn Most Wicked or an exclusive cut scene from A Darkness Strange and Lovely.